Dramatic ironwork-inspired details. Simple slip-stitch cables playing against bold colour blocks. 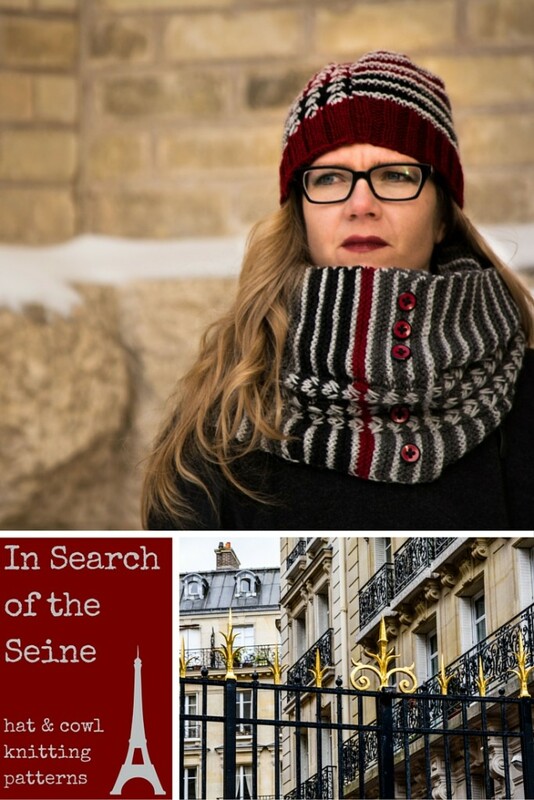 Introducing In Search of the Seine, a hat and cowl set. In addition to my perennial desire to stop being cold, this one was inspired by our trip to Paris in 2014 and you can read more later this week about about how important it was that I got lost in Paris. 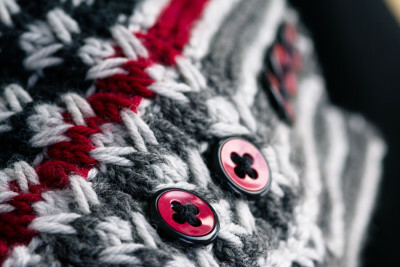 The In Search of the Seine patterns are both knit in worsted weight. The cowl is knit side-to-side and then sewn together with a bit of overlap. There is both a neckwarmer size (smaller in circumference and height and meant to loop once to fit behind your jacket collar) and a cowl size (double looped, luscious, cozy). The hat comes in 6 sizes from Baby to Adult Large. For this week they are both 25% off. The discount is automatically applied at checkout. I had fun playing with colour blocks to make this a bold, graphic set. 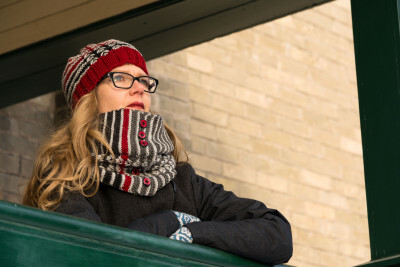 The cowl uses 4 colours while the hat uses the 3 accent colours you’ll have as leftovers. For the cowl, the buttons are attached on the overlapped section and there are no button-holes to work. If the buttons on the cowl are decorative, aren’t they optional? Yes, but who doesn’t want a little punch of detail to draw attention to their face? I’ve included directions and photos for sewing the cowl together since I know that worries about finishing can keep people away from something they otherwise love. It’s really simple and the photos make it super clear. Want to know more about yardage, skills used in the patterns, etc? No problem! 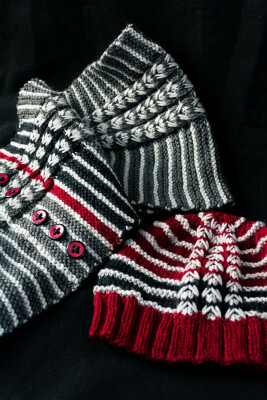 Read more about the hat and cowl. ← Gnomes, cheese, and a newsletter. Love the way you’ve designed the flow of lines, the slip stitch cable juxtaposed against the parallel vertical lines. That cowl looks so delicious and warm! I may have to do some stash diving….